Brad Grady’s lightly-raced Girvin headlines next Saturday’s Grade 2, $1 million Twinspires.com Louisiana Derby, in which he will face off against eight other sophomores in the 1 1/8-mile event on the main track at Fair Grounds Race Course. The Louisiana Derby is the final Fair Grounds prep for the Kentucky Derby and offers 170 qualifying points toward that event on a 100-40-20-10 basis. Trained by Joe Sharp, Girvin exits a facile 2-length win in last month’s Grade 2 Risen Star Stakes in what was just his third career start, all of which have come at Fair Grounds. The son of Tale of Ekati had previously broken his maiden on the dirt in December before finishing second in the Keith Gee Memorial over the turf course in a designed prep for the Risen Star. Brian Hernandez, Jr., who has been aboard for all three of Girvin’s lifetime starts, retains the call from post eight. Two of the horses who followed Girvin home in the Risen Star appear to be the 8/5 morning line favorite’s main threats. William Farish and Lora Jean Kilroy’s Guest Suite turned in a powerful effort to win the Grade 3 Lecomte Stakes in January over the Fair Grounds main track before settling for fourth behind Girvin five weeks later in the Risen Star. Robby Albarado has the return call on the son of Quality Road for trainer Neil Howard from post six. E Five Racing Thoroughbreds’ Steve Asmussen-trained Local Hero impressed in an easy maiden win in his two-turn debut in January before stepping up to finish third in the Risen Star. Florent Geroux rides the Hard Spun colt from post three. Trainer Todd Pletcher entered a pair of Florida-based maiden winners who will hope to punch a late ticket to the Kentucky Derby. Calumet Farm’s Patch broke his maiden at second asking last month in a one-turn mile at Gulfstream Park after finishing a rallying second over six furlongs in his January debut over the same surface. Tyler Gaffalione picks up the mount on the Union Rags colt from the rail. Derrick Smith, Repole Stable, Michael Tabor, and Mrs. John Magnier’s Monaco was sent to Tampa Bay Downs to break his maiden by a widening 12 lengths in his third career start in February, and he returns to Fair Grounds with the addition of blinkers for his first try in stakes company. Rajiv Maragh rides the son of Uncle Mo from post five. #6 Guest Suite – I tried to get a little tricky here and play against Girvin because I’m not sold on him. However, to be honest, I’m not sold on Guest Suite, either. His company lines are solid: he ran competitively against McCraken as a 2-year-old, and two races back, he beat Untrapped, who came back to run a solid second in the Rebel Stakes. Last time out, he ran fairly well to finish fourth in the Risen Star after a terrible trip. If his trip is better this time, he can pull off a mild upset. I think he’s more talented than anyone else in the field. 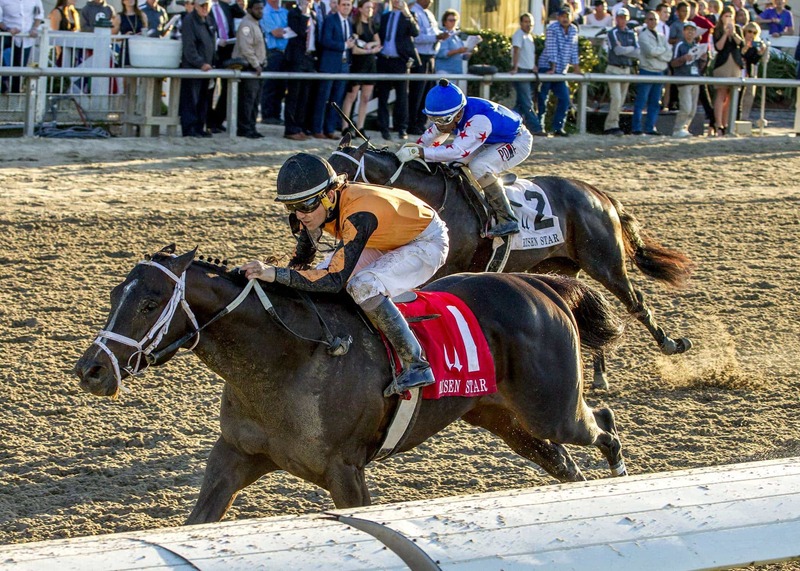 #8 Girvin – Right after the Risen Star, I certainly thought I’d be taking a stand against him in the Louisiana Derby, but as time passed it, became harder and harder to make a case against him. Also, there’s no way around it, the field that showed up for this race is very weak. Girvin will go off as the deserving favorite, but I can’t take that low of a price for him on top. Already locked into the Kentucky Derby, this race won’t make or break him, but he’ll have a big chance to make it two in a row. #1 Patch – He broke his maiden at Gulfstream Park last time out going a mile in what was a visually impressive effort. I assumed his speed figures would be high for the race, but it didn’t come back strong, so I’m a little confused about that race in general. Obviously, with Todd Pletcher on his side, you have to like his chances, and it’s been interesting to see Pletcher have success in preps outside of Gulfstream Park this year. He should make some noise in here, and he’s one that would be risky to leave off of a Pick 4 ticket. #5 Monaco – He was sent to Tampa Bay last time out to break his maiden and was successful, winning by twelve lengths. It’s very possible that the race could be fool’s gold, though, as the quality of the field was very questionable, and these Tampa Bay maiden special weights can sometimes be tricky. With these strong connections, he’ll have a shot today, but there is no doubt from a speed figure standpoint that he’ll have to improve. #3 Local Hero – There was a point in the Risen Star where you had the feeling that Local Hero might put on a show, but he faded in the stretch and could only hold on for third. If he can carry his early speed a little longer in this spot, he’ll have a shot, and there’s no doubt that he’ll be on the lead with a chance to do that today. I can’t have confidence that he can do that until I see it, but he should stick around and hit the board in this race. #4 Senior Investment – There are plenty of positives with this horse, with the best being the likely price he’ll be in this race. Last time out, this horse was a very sharp winner at Oaklawn Park in an allowance race that was full of horses trying to make their way into stakes company. You also must like the fact that the horse has a win over the Fair Grounds course. It should have been two wins over the track, but he was disqualified from a winning effort two races back. These connections hooked up last week to finish second at a big price in the Spiral Stakes. #2 Hollywood Handsome – He will have to elevate his game today to have any chance. He was a so-so maiden special weight winner two races back, but then finished third last out in an allowance effort. His connections are most likely just swinging for the fences here. #7 Sorry Erik – He earned himself a shot in the Risen Star after back-to-back wins, but he ran poorly in that race and finished seventh. He was beaten 10 lengths that day by Girvin, so it’s hard for me to see him turning the tables today. #9 Hotfoot – He ran seven days ago in an allowance race and was beaten 24 lengths. Surely, he will be scratching from this spot, right?